206 pages | 50 B/W Illus. In this book, Tsiambaos redefines the ground-breaking theory of Greek architect and town planner Constantinos A. Doxiadis (The Form of Space in Ancient Greece) and moves his thesis away from antiquity and ancient architecture, instead arguing that it can only be understood as a theory founded in modernity. In light of this, the author explores Doxiadis’ theory in relation to the work of the controversial Greek architect Dimitris Pikionis. This parallel investigation of the philosophical content of Doxiadis’ theory and the design principles of Pikionis’ work establishes a new frame of reference and creates a valuable and original interpretation of their work. Using innovative cross-disciplinary tools and methods which expand the historical boundaries of interwar modernism, the book restructures the ground of an alternative modernity that looks towards the future through a mirror that reflects the ancient past. From Doxiadis’ Theory to Pikionis’ Work: Reflections of Antiquity in Modern Architecture is fascinating reading for all scholars and students with an interest in modernism and antiquity, the history and theory of architecture, the history of ideas and aesthetics or town planning theory and design. "Playing on the schematism of its title, this book claims that architecture’s ‘theory’ and ‘work’ are intrinsically connected, and so are its pasts and its presents, if Architecture is to keep projecting futures. 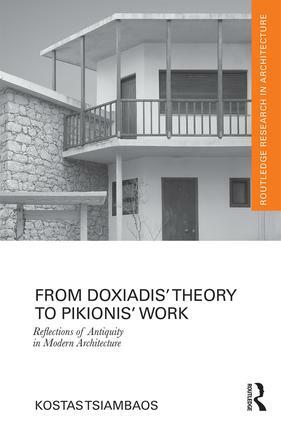 Weaving a complex web of references, this original reexamination of Pikionis and Doxiadis "in relation" questions those appeasing dualistic histories of architecture that relegate them to a scene of alternative modernism. Here instead they unsettle modernism’s certainties and expose its contradictions, and thus speak to the present of Architecture." Kostas Tsiambaos is an Assistant Professor of the History of Architecture at the School of Architecture, National Technical University of Athens (NTUA), Greece. His research interests focus on the promotion and use of concepts and interpretive tools borrowed from philosophy, political theory and psychoanalysis in the history and theory of modern and contemporary architecture. His research has been published in international collective volumes and journals including the Journal of Architecture, ARQ and Architectural Histories.